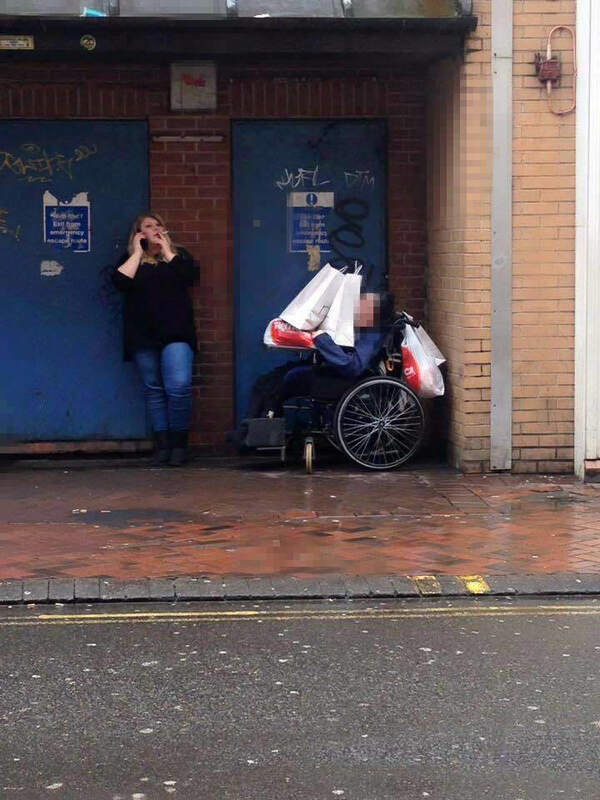 A very shocking image shared on Facebook has gone viral after it appeared to show a Mencap support worker stacking shopping bags on top of a vulnerable man in a wheelchair – while she talks on her phone during a cigarette break. The photograph was uploaded to the charity’s Facebook page by Charlotte Shaw, 24, who originally spotted the image on Leicester’s ‘Spotted’ page. Shaw, from Market Harborough, Leicestershire, says the photo was taken in Leicester City Centre. The man looks to be in physical pain in the photo. One of your staff in the Leicestershire area smoking whilst on the phone in Leicester shoving all of her shopping bags on top of him with no care in the world. I don’t think she should be able to work with vulnerable people who need care. We spoke to Charlotte, who said she hopes the post will raise awareness. Mencap took action after the image was posted and replied to say they had suspended the woman. We are appalled by what is happening in the picture. After seeing it we immediately took action, and have suspended the support worker in question and reported the issue to the relevant local authority safeguarding team. We take the wellbeing of the people we support extremely seriously, and we expect and train our staff to deliver high quality care and support services. What we see here would fall well below that standard. Our priority now, as always, is ensuring that we offer the highest quality of care to our beneficiaries so they live the lives they choose. Steve Baker, Regional Director of Services at Mencap, told The Independent that the man in the photo had ‘limited capacity’ to consent or understand what was going on. This is shocking. Let’s hope she (or anyone else like her) is never employed in support care again.